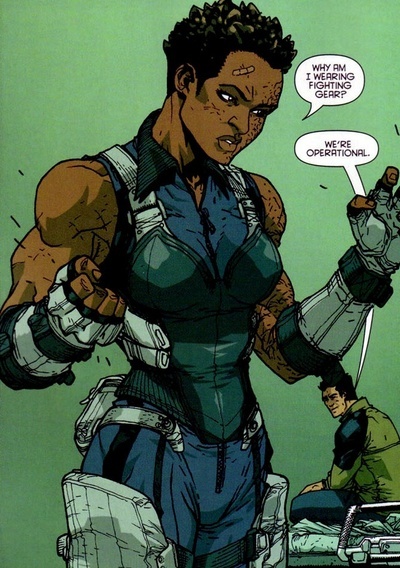 Powers: She has superhuman strength and endurance which she can further enhance by increasing her density. With her density powers supplied she is invulnerable to gun fire and most conventional forms of attack. As a child growing up in Kenya she had a rough life. Her grandfather had lost both his legs in the mau mau uprising of 1952 and her mother lost an eye during an attempted coup during 1982 when she was a student. Her mother’s ultimate fate was never revealed though her Father and brother were later both killed in border skirmishes with Tanzania. She became a ward of the state. Her strength was noted almost immediately and she was prepped as a possible candidate for the Olympics. At puberty when her powers came out fully Stormwatch stepped in and began her training as a reserve member if ever the need should arise. That time did come after Despot decimated the Stormwatch ranks. She is a withdrawn woman with a strong sense of morality who loves the earth and it’s people more than its her own life. ← Stormhunter- The Black Panther & Kraven clash!!! She was strong, intelligent, and could hit you with humour as sharp as razors. She was indispensable to Stormwatch right up until the book was cancelled and she was set onto the Monarchy. I lost track of her then, but she was able to survive the massacre of the team by Xenomorphs in the Wild C.A.T.s /Aliens crossover.